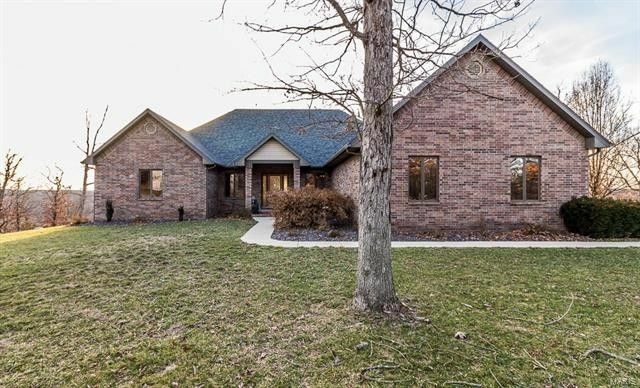 INCREDIBLE RIVER BOTTOM VIEWS FROM THIS ALL BRICK HOME WITH 20 ACRES ! LOCATED BY BENNETT SPRINGS STATE PARKTHIS CUSTOM BUILT HOME HAS A FULL PARTIALLY FINISHED WALK OUT BASEMENT, 4 BEDROOMS, PLUS A HOME OFFICE W/ MANY BUILT IN BOOKCASES & DESK. 3 FULL AND ONE 1/2 BATH, VERY OPEN FLOOR PLAN, MAIN LEVEL HAS HARDWOOD FLOORS, LARGE MASTER BEDROOM AND MASTER BATH WITH A JETTED TUB, WALK IN TILE SHOWER, LARGE WALK IN CLOSET, MAIN LEVEL LIVING , FORMAL DINING, LARGE KITCHEN WITH MANY CABINETS, WITH GRANITE COUNTERS. A GREAT DINING VIEW FROM THE CORNER BREAKFAST TABLE OR YOUR LARGE COVERED REAR DECK. LOWER LEVEL OFFERS 2 BEDROOMS, AND A FULL BATH, LARGE FAMILY RECREATION ROOM, A LOT OF UNFINISHED STORAGE. OAK TRIM & DOORS, ANDERSON WINDOWS. INSULATED 30 X 48 WORK SHOP WITH A BATH & LAUNDRY HOOKUP FOR POSSIBLE EXTRA LIVING SPACE. ASPHALT ROADS ALL THE WAY TO YOUR DOOR. 2 HEATING & COOLING UNITS. AUTO START GENERATOR SO YOU'LL NOT BE WITH OUT POWER. BUILT BY RANDY WALL CONSTRUCTION.